MOPAR JOHNS EK2 SUPERBIRD RESTORATION!! 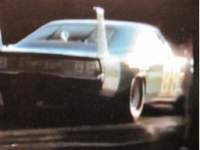 DodgeCharger.com Forum > Discussion Boards > Aero Cars (Moderators: Chryco Psycho, hemigeno, firefighter3931, Charger-Bodie) > MOPAR JOHNS EK2 SUPERBIRD RESTORATION!! Re: MOPAR JOHNS EK2 SUPERBIRD RESTORATION!! John, All I can say is HAT'S OFF! I will only have time, in my next life time, to pay that kind of attention to detail on my 'bird! Unfortunately, I'm told by some that the car among other things won't be coming with me! CORRECT LEAF SPRING SHACKLES FOR A SUPERBIRD! While I was under the Superbird for the exhaust tip hanger I took care of another item that I brought back from Troy Angelly's shop. This item was a pair of correct leaf spring shackles. One of the judges at Carlisle informed us that we had one correct and one wrong leaf spring shackle!@#$%^&*! So after I was schooled on what was correct I put out some want ads and got a reply from a guy in California with a real nice pair. The only problem is that they had some kind of yellow/gold paint on them. I didn't want to bead blast them and loose some of the character so I sent them down to Troy to chemically remove the paint. We also picked those up on Tuesday and are now installed! The first picture shows one of the leaf spring shackles removed. The second picture shows one correct and one incorrect laying side by side. The third picture shows the correct leaf spring shackle installed. The last picture shows another view of the shackles with my notes. The correct shackle has smaller side plates but shafts are just a touch bigger. The other difference is that the correct hubs in the side plates are larger. It's all so close you wouldn't notice from one side of the car to the other unless you were a well seasoned judge! Where did the 'bad' one come from? Years ago I decided to upgrade to a Dana rear end under this Superbird. I probably looked at all the shackles and installed the ones that had the least amount of pitting not knowing what I know now! When the Superbird was restored we again changed rear ends and went back to a 8 3/4 out of another 1970 B Body. Too bad I didn't have all the goodies back home and on the Superbird for your visit! It also looks a lot better all shined up for the show. Looking forward to the updates! Which 'show' are you speaking of? The show we went to was the Mopars at the Red Barns on the Gilmore Car Museum grounds in Hickory Corners, Michigan. It was last Saturday with around 400 cars and trucks. There were 3 Daytonas and 6 Superbirds in the show! 2018 Mopars at the Red Barns! Here are a couple of pictures of the Superbird on the show field. The first one also shows the white Superbird of Zane and Janet Whitcomb from my home town of Westville, Indiana! The second picture also has the Custom paint Superbird of fellow CMC members Pat and Cheryl McConnell. The weather was great for the show and I quickly walked the swap area. All I came home with was a very nice 1969-1970 style cigarette lighter knob that I installed on one of my NOS elements. The last picture is of the NOS inside window cranks of which the last 4 were installed on the Superbird before the show! I have to ask...what's with the white 'PLYMOUTH' on your EK2 car? The white letters on orange is why I migrate towards the EV2 cars, but yours is obviously EK2? Did some slip through with white letters? If so, since you didn't buy the car new, was it somewhat easy to verify? I thought they were all black? If you go to page 3 on my B5 Daytona story you will see pictures of the Superbird from when I bought it in the early part of it's life. It had mostly original paint back then with the white decals. I have seen FJ5 green Superbirds with both white and black decals also. So I don't think the Chrysler chart that many go by is 100%. Still making progress on the nicest superbird around! Im happy to see the nose gasket straightend out. I was disapointed when I saw it at carlisle. excuse the rotated photo.....Im fighting with my computer. I would like to thank Dave for his comments! He has been restoring a Superbird at a very high level and knows his stuff. His picture reminded me of the next thing to post about. Here is another item that came up at the judging at Carlisle, hood pin washers. My first picture shows the hood pin washer that was in place at Carlisle. My second picture shows one of my original washers that I shipped down to Troy Angelly and had restored. My third picture shows the 2 washers side by side and you can see that one is thicker than the other. The thicker one is correct and you see it installed in my last picture. Just another detail item off my list! John, your Superbird turned out great. What a beautiful car. Looks like size, in this case, thickness, matters! Are those hood pin washers conical too? If you look closely at the second picture the thick washer laying there is raised up in the center. My first picture shows how the trunk of the Superbird looked a couple of weeks before the Red Barns show. No spare tire and wheel! This part of the story goes back to Talladega 1988 when I had two sidewalls come off my original tires. At that time I decided to put a 5th rallye wheel on the spare so if I had to use it would look right. Little did I know the problems it would cause me down the road with wheels. So when we first had the Superbird restored we bought and installed an NOS 15 inch wheel but it was wrong with extra holes. There is probably a picture back in this story. Then I bought a correct 2944450 wheel and it has been in there since the restoration. The 2944450 wheels are hard to find and pricy! So much so that they have been reproduced recently. The problem with that wheel is that it was dated 6 0 or June of 1970 which is AFTER the Superbird was built. Last fall a friend of mine advertised a 2944450 wheel dated 10 14 or October 14th 1969. That wheel was a perfect date for a Superbird built in November 1969! So we met at the CMC winter swap and traded wheels. I then boxed up the 10 14 wheel and sent it down to Troy Angelly to get cleaned up and painted. So on our trip down there we took our spare tire and had Troy mount it on the freshly painted rim. You see it in my second picture. The third picture is a close up of the date code in the 2944450 wheel. The last picture shows the spare tire and wheel installed and ready for the Red Barns show! on the wheel was a deduction that is now fixed! Thanks for your observation on the jack mechanism! This is the original rear jack for this car and there were no signs of gray paint under the black paint. So we repainted it the way it was. I would like to hear from Superbird owners that have unrestored jacks in their trunks on what they have? I guess I will have to start looking in friends of mine trunks to see what they have? Your 9J or September 1969 date code on the jack seems a bit early to me for a Superbird. I hope some others add to the post here with what they have. Thanks a lot John...now you're jacking me around!